We have new egg counts. Evanston Library has 4 eggs. Savanna, IL has 5 eggs. St. Mary’s Hospital (Chicago) has 5 eggs. Pilsen (Chicago) has 2 eggs. Waukegan has 2 confirmed by webcam, maybe 3 — hard to tell for sure. 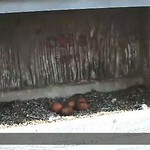 Five eggs is a pretty big clutch. Wonder if we are going to have a bumper crop this year?